I hope that you all had an opportunity to enjoy the long weekend. The weather was a little suspect at times but that did not keep me from getting all of the yard work done! Kaleidoscope 38: Leading us into the weekend was an awesome Kaleidoscope presentation at the Civic Center. This event is the capstone of our Fine Arts program and the students did not disappoint. The beauty of Kaleidoscope is that the musical pieces are all arranged so that there is very little down time. Balconies, lifts, and a double stage are all utilized so that the two hour performance seems to fly by. I really enjoyed the finale. I am a fan of the band Chicago, and Mr. Davern and his crew did a great arrangement of a couple of Chicago tunes that featured all of the students in attendance. It is always the coolest thing to see the curtain rise and see almost 500 students perfectly positioned and ready to sing. Thanks to all for an amazing evening! Memorial Day Parade: Thank you also to all of our students and staff who participated in the Memorial Day Parade in the Village of Camillus. Well represented is an understatement. I really do feel as though our students truly understand the meaning of Memorial Day. Last Day of Classes at the High School: My boys reminded me that there are only seven class days left in the high school before final exams. Wow! We are here already and I know the time will fly by quickly. In the days to come, we have some honors and awards nights followed by graduation rehearsal. Crazy. 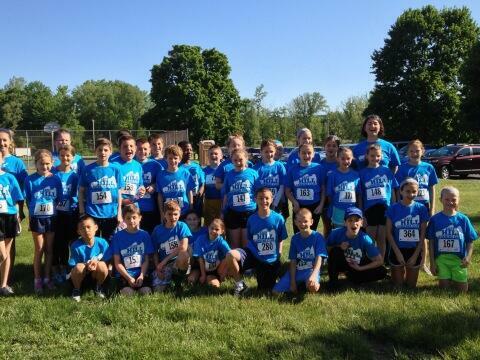 Athletic Teams Compete: Congratulations to our athletic teams. 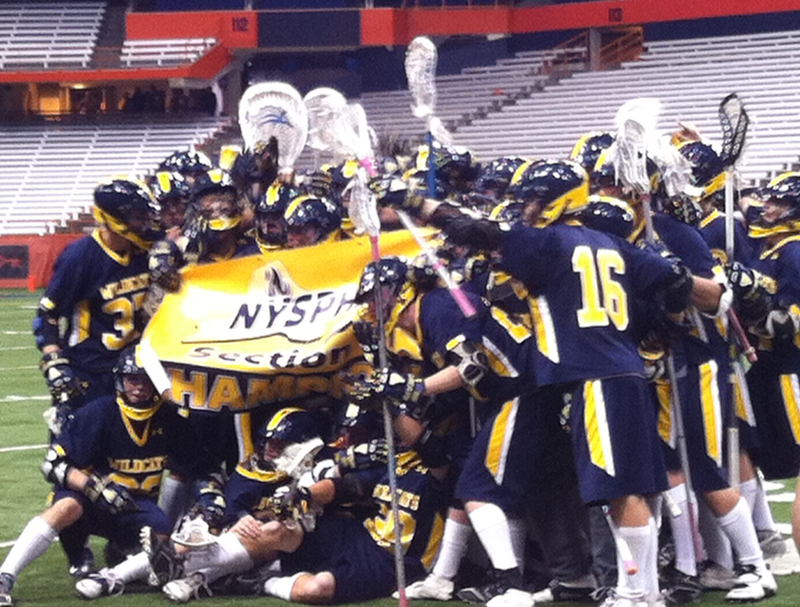 The boys lacrosse team won the Section III Championship in double overtime, we still have runners in competition, as well as members of the tennis and boys golf teams. West Genesee Phone App: Hopefully you have had an opportunity to download our new "West Genesee" phone app. The more I use it and customize it, the more I like it. There is also a Schooltool mobile website that we linked to last week that works very well. Windows and Blackberry apps are coming soon. Enjoy! Construction to Start Soon: Lastly, I was asked to update the community on the construction along West Genesee Street. The major area of work is between Stonehedge Drive and Route 173. There will also be limited work between Munro Road and Parsons Drive, but that will not be as disruptive. 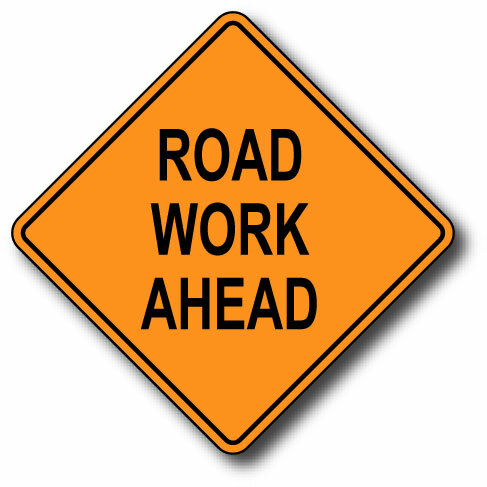 The work between Stonehedge Drive and Vanida Drive will not begin until school is completed in a couple of weeks. Don't blink or you might miss the end of the school year! Thank You and Heads Up! Budget Vote: On behalf of the Board of Education and all of our staff, I would like to personally thank our community for their overwhelming support of our 2013-2014 school budget. We do not take your support for granted, and we will continue to provide the excellence that you have come to expect at West Genesee. 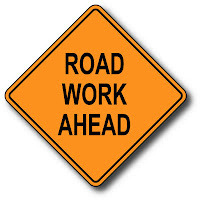 Upcoming Road Project: On another note this is a heads up to let you know that Onondaga County has a very large road project that is about to begin on West Genesee Street between Parsons Drive and Route 173. We met with their engineers who were very friendly and informative. They also did not pull any punches. This project is going to cause major inconveniences along West Genesee Street, particularly at the High School entrance and Vanida Drive, which is the main roadway to West Genesee Middle School, Stonehedge Elementary School, and the District Office. The construction is set to begin any day now with the high school and Vanida Drive areas affected first. The project could go deep into the fall and work will include Saturdays. I hope to see all of you at Kaleidoscope tomorrow night at the Civic Center or at many of our sporting events today through Friday. If not, have a wonderful Memorial weekend and I will write again next week. A Great Week to be a Wildcat! I hope that you all enjoyed the beautiful weekend. Last week many great things happened. I like to watch the students try their best, overcome obstacles, and then see their smiles as they show how very proud they are of their accomplishments. I like to think that I am pretty "tough" because of all that I have to deal with every day, but I have yet to leave with a dry eye and this was fourteen years and counting. I am proud of all who participated. Thanks for trying your best! Seniors have a "Diamond Studded Affair": The Senior Ball was this weekend along with the After-the-Ball Party. The Ball itself was a very enjoyable affair. The students were great. It was like a big dinner party with some dancing afterwards. Who was crowned King and Queen you ask? This class has been so enjoyable for all of the staff that ALL of the students were crowned King and Queen. This is the first time that I have seen this happen in all of my years in education. The after party was extremely well attended, as well. I want to thank all of the organizers for pulling it all together AND giving up their evening to help keep our students safe. 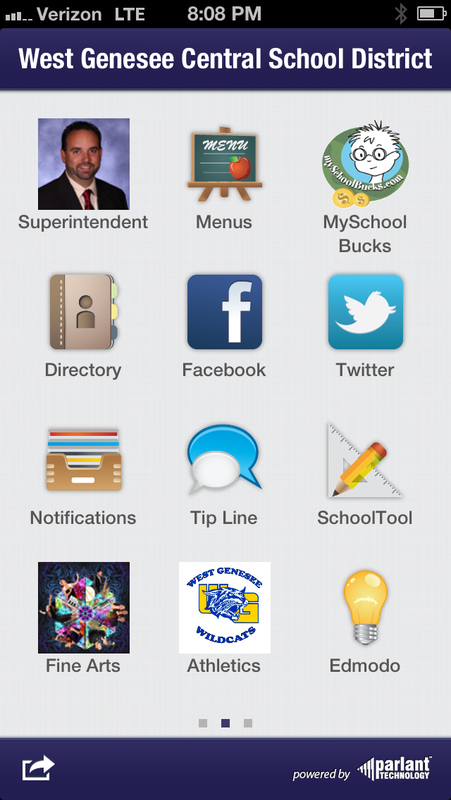 West Genesee CSD Phone App: Yes, there is an "App" for that. If you have a smart phone and are interested in all things West Genesee, then you need to go to your App store and download the "West Genesee" App (Blackberry and Windows phone compatible coming soon). The App allows you to completely customize what you receive from the school. To use it on an iPAD, download it from the App store as an iphone App, then use it on the iPAD in 1X (stays the size of the iphone screen) or 2X mode (to expand to the entire screen). Check it out! Annual Budget Vote: Tuesday is a very important day for West Genesee. Voters will be considering our spending plan for the next school year and will also be electing Board of Education members. Please remember to take the time to vote from 6:00 a.m.-9:00 p.m. at the high school auditorium. Your continued support is greatly appreciated! Kaleidoscope/Days Off: Remember that Kaleidoscope is this Thursday night at the Civic Center downtown. Also, school is closed on Friday as well as the following Monday and Tuesday. Have a wonderful week! Thanks! If you are well connected to our school community, you know that we lost one of our own late last week. Susan "Suzie" Wolfram, a volunteer and teacher aide at Stonehedge Elementary School, passed away from breast cancer. Sue was certainly an amazing person. She worked in the Stonehedge Blue Cafeteria, always wore a smile, had a funny story to share, and was heavily involved in the girls lacrosse program and Stonehedge PTA. Last Thursday at the girl's JV and Varsity lacrosse games, a fundraiser was held for Sue. In between the two games, we received word that she had passed away. 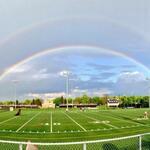 Within a minute of hearing the news, a double rainbow appeared over our turf field. Simply amazing! She will be truly missed in our community. In my opinion, Charlie Miller from the Post Standard wrote the best piece about her life... click here to read it. Suzie would want us to celebrate the things we have and try to help those who need help. A true class act. We experienced another miracle a week before in our high school. 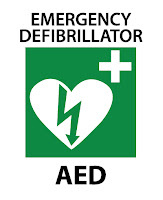 A 40 year old teacher went into full cardiac arrest at the end of the day on a Friday. He was found by a past graduate who stopped by to see this teacher. He summoned a nearby teacher and the nurse who immediately started CPR. 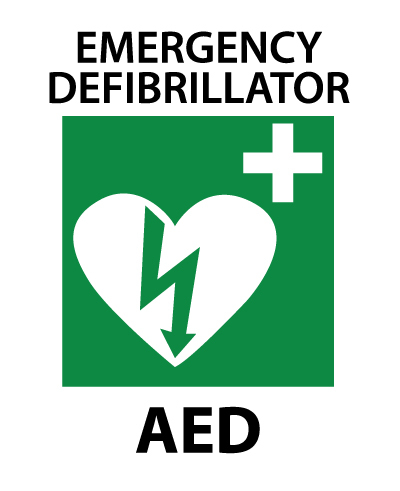 Soon Camillus Police, Fairmount Fire, and WAVES Ambulance appeared to administer the AED on him. He was transported to the hospital where he is recovering. If that former student didn't stop to see him, we would be working through another loss. Simply incredible. A huge thank you to our school nurse, Camillus Police, Fairmount Fire Department, and WAVES Ambulance. I have seen a lot in my fourteen years as Superintendent, but one thing that never gets old is the POWER of COMMUNITY. Our community can do some amazing things when the going gets tough and people need help. I am very proud to live and work here. Take some time this week to thank people who have helped you. Take some time this week to help someone else. Surprise someone with a random act of kindness! I will get back to writing about testing, bus runs, graduation, awards nights, and concerts next week. There are other things to think about this week. I hope that all of you had a chance to enjoy the fantastic weather over the weekend. It was a beautiful day for the Mountain Goat Run downtown, and I got to see so many of our community members that we probably could have had the run right in Camillus! 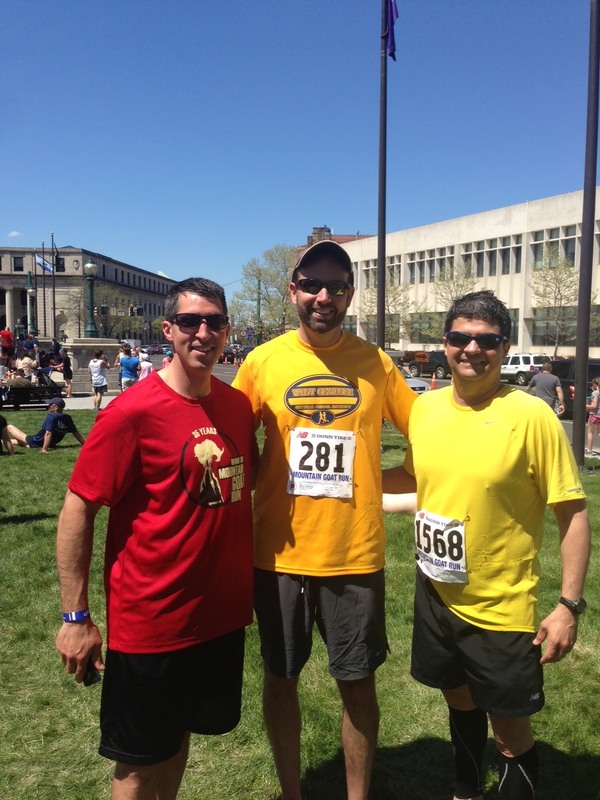 Thanks to all who organized the event and also a special thanks to all of the emergency personnel who kept us safe. Very much appreciated. Sporting Event Update: I had the opportunity to get to all of our sporting events last week including a stint in the varsity baseball dugout that caused my suit pants to go to the dry cleaner. Well worth it. I love baseball chatter, softball chants, and was happy I got to watch both my boys score in a track meet. 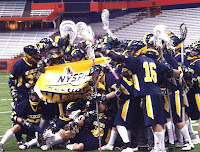 Lacrosse is nearing the peak of the season, so if you want to see some of the best male and female players in New York State, check out the schedule from the link on the athletics page and get yourself to a game! Students Excel: We also had an awesome Art Show at the high school for junior and senior artists. Much of the art was showroom quality and several parents want to purchase pieces from the students even though I don't believe they are for sale. Outstanding work! Congratulations to Amelia Ryan from CMS who placed first to win the New York/New England District Optimist Oratorical Contest! Mark Kopp from WGMS also competed at that level and was a runner up. Both speeches were outstanding in a very tough competition. Great job to both of them.... They are pictured at left with their teachers, Erin Stepowany and Susan Marshall who coached them throughout the process. Why do our buses have so few students on them? How can additional time be created for middle school students who need extra help? These are both great questions and they have been taking up space in my brain for five years. I think we have found a great solution for both. Transportation: First the transportation piece. We have 87 school buses covering about 90 square miles of the District each day. Our buses travel about 1,000,000 miles per year. We are required to transport students to private, charter, and parochial schools in the surrounding area, but for students traveling in-district, we try to keep the bus ride to 50 minutes or less. Our elementary buses are generally full each day, but our middle school and high school buses have not been. If we try to consolidate bus runs, the travel time increases in-district to over an hour and in some cases up to an hour and a half. This is not acceptable. Interaction Time: Students in our high school have been able to receive extra help from teachers on an as needed basis for many years. This extra time has been very beneficial for the high school students and is officially called "Interaction Time". We have been looking at a way to provide this exact same model at the middle schools. Thanks to some very crafty work by our Director of Transportation Jerry Williams, we will be able to bring middle school and high school students to school and back home on the same buses each day. This allows us to schedule an "Interaction Time" for our middle school students. A true win/win. Our buses will be full, and our middle school students will be able to receive additional help if they need it. As a bonus, middle school students will also have access to our computer labs, library, and Learning Centers if they need to use those resources as well. Because middle school and high school students will be riding together, we are also able to adjust the start time for middle schools for next year. Middle schools next year will begin at 7:30 a.m. and the regular day will end at 2:10 p.m.. "Interaction Time" will begin at 2:15 and will end at 2:50 p.m.. The high school and elementary school start times will remain unchanged for the 2013-2014 school year. We will evaluate this new initiative throughout the year and decide if we can make any changes to the elementary day for 2015. It will depend on exactly how long it takes each day to transport our middle school and high school students home. We are very excited to accomplish these goals. Thanks to everyone in transportation, our administrators, our Shared Decision Making groups, and Parent/Teacher Organizations/Associations at the middle schools for helping us to work through these concepts. Middle school parents will be receiving more information from their building principals in the coming weeks. A very busy but exciting week ahead. I hope to see you at the many upcoming events.